← Monster #262 — How does that thing work? aweeeeeeeeeee this is adorable!!!!! the cute little fella wants ice cream, i like the idea of putting picture instead of words in the dialog cloud. Are those tights army regulation? You know what? I recently read that men’s tights are making a come back. Smoother lines under your trousers…. 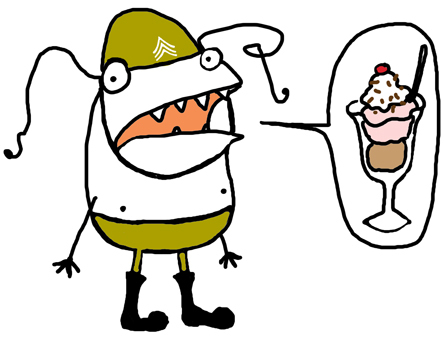 I think he’s name should be Sargeant Sundae. You’re right. That’s not parfait, it’s a sundae. Is he a Cold War era Sargeant? Hmmm good man- I often get the same cravings! Those boots! Those antennae! Those jimmies! I bet I could run into this guy at Denny’s.